Being invited to a wedding means you have an important role in the life of the soon-to-be newlyweds. Whether you are a family member, a close friend or just a colleague, the bride and groom have chosen you to witness their most special day! Are you a man (woman) of few words? Then these short wedding wishes are perfect for you! 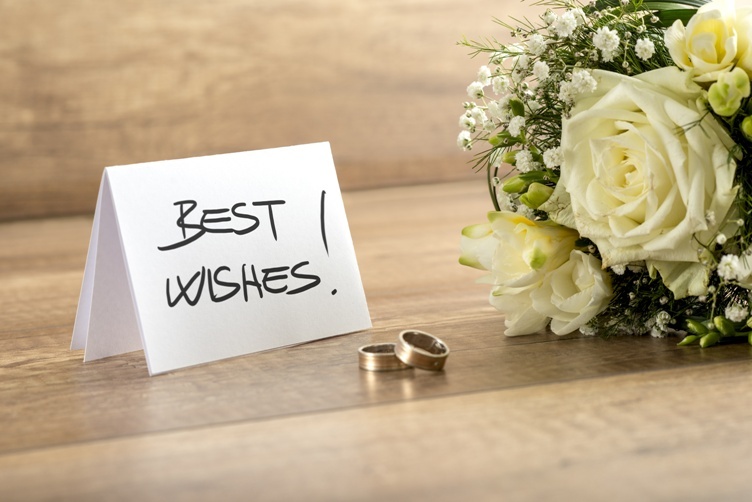 If you are a fan of formal wedding wishes that sound both sophisticated and romantic, you can choose one of these timeless wedding wishes! If you have a sense of humor and the couple whose wedding you’re attending appreciates a good laugh, it’s OK to include a funny message in the wedding card! If you are on the poetic side of life, you may want to choose a verse (or two) that best resonates with what’s inside your heart and share it with the happy couple. Here are our favorite wedding card poems! ..and you will be happy. Just like the cherry on top of the cake a warm wedding card closing has the power to melt any newlywed couple’s heart. Pick yours!